The 28.62 metre motor yacht Vicious Rumour, listed for sale by Peter Redford and Eugenio Cannarsa at Fraser, has been sold with the buyer introduced by Igor Cherentaev at Azimut Russia. Designed by Stefano Righini, Vicious Rumour was built in GRP by Italian yard Azimut to RINA class and delivered in 2017 as an AZ 95 model. An interior designed by Salvagni Architetti sleeps 10 guests in five cabins configured as a master suite, two VIP suites and two twins. All cabins have entertainment centres, television screens and en suite bathroom facilities while a further two cabins sleep three crewmembers. The main saloon features an elegant, tranquil décor with ample seating provided by three sofas upholstered in soft aqua lime. Two cocktail tables flank the sofas, while a full-service bar, situated aft, easily services the saloon and aft deck areas. The glass-topped dining table is surrounded by woven rattan chairs in a rich tobacco-coloured finish, seating up to ten guests. 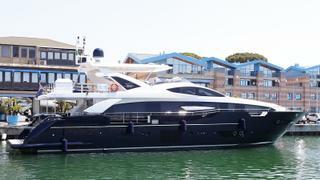 Outdoors, the flybridge is accessed from either the aft deck or the pilothouse. This area was specifically designed for al fresco entertaining. It includes a very large wraparound seating arrangement and table, a bar with built-in stools perfect for happy hour and a whirlpool Jacuzzi surrounded by sunpads. Twin 16V 2000 M84 MTU diesel engines allow a cruising speed of 23 knots, topping out at 27 knots. Vicious Rumour was asking €4,950,000.